Marquette defeated St. John's, 93-71, at home last season. Marquette basketball refuses to go away. 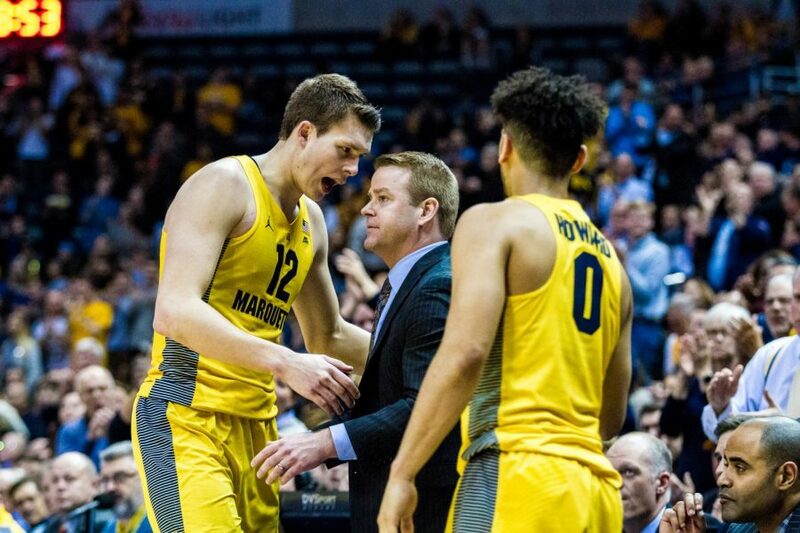 After losing to Providence on National Marquette Day and St. John’s in Queens, New York, Feb. 10, the Golden Eagles’ March Madness hopes were reduced to nearly zero. The Golden Eagles’ 16-point comeback victory on the road against Creighton didn’t entirely revive those hopes; BracketMatrix, an aggregator of 113 March Madness projects, has Marquette in its “next four out.” However, the win kept Marquette’s persistent hopes alive. In order to continue their run, the Golden Eagles need to defeat the St. John’s Red Storm. Tipoff is at 7:30 p.m. on Fox Sports Wisconsin. Red Storm point guard Shamorie Ponds put together one of the best individual performances of the season in his first game against Marquette, pouring in 44 points on 16-of-23 shooting. His scoring prowess has powered St. John’s to a four-game winning streak and caught everyone’s attention, especially Marquette’s. “He’s a kid that’s playing as well as any guard in our conference, and he makes them go,” Wojo said. Freshman power forward Theo John, who missed the road date with St. John’s due to an undisclosed illness, has a particularly difficult job. When Ponds gets in the lane, he often doesn’t make the choice to shoot or dish to a teammate until the last second, meaning John has to make a snap decision about whether to commit to help defense and risk giving up an easy assist. Junior Matt Heldt, who faces the same predicament as John does in the post, emphasized the importance of preventing Ponds from playing in transition. It’s quite possible that Marquette will have to outscore the red-hot Red Storm without sophomore scorer Markus Howard, who contused his right hip against Creighton while colliding with Bluejay center Toby Hegner. Howard’s presumed absence means someone else will have to pick up the scoring load. That task may fall to freshman Greg Elliott, who has scored in double figures in three of the last five games. Although coaches and players are hoping for the best, the overall mantra is the same: carry on. “We need guys to step up like they did against Creighton,” Wojo said. Teams on the verge of making March Madness are often the subjects of endless prognostications from college basketball analysts, to the point where a team’s “resume” of quality wins or bad losses can overshadow the team’s actual play. His players are of a similar mindset. Heldt, one of only two scholarship upperclassmen on the roster, is aware of the dangers that lie in getting too high or too low based on the most recent result. Marquette is still in search of something much more elusive than a March Madness bid: consistency. The team has not won consecutive games since Jan. 3, although Wojo believes his players have the talent to do so. “Our team has shown that we’re capable of playing at a high level. The challenge for us is doing it consistently,” Wojo said.